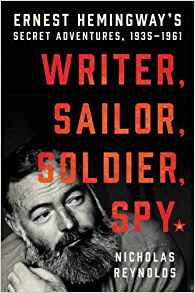 Reynold's book makes a case for Hemingway's role as an intelligence officer, a soldier, and a combat sailor... although all on his own terms. A leftist in the 1930s, documents show that he was even recruited by the NKVD, although whether or not he could have been useful to them is problematic. Papa Hemingway was a man larger than life and this book looks at what is no doubt his dark side in the cause of anti-fascism.